What is going on in Japan since March 11, 2011? Radiation generated by collapse of radioactive material that is invisible to the eye pierces cells of animals and plants and human body. In Fukushima contamination is now omnipresent, you cannot see it nor smell it, nor taste it but it is there. And in 2016, an unprecedented public project is about to start in the world. Japan’s contamination is made visible by its 1/1000 second clicking sounds. You can’t see it but you can now visualize the power of those radioactive disintegrations by hearing their sounds, so that the inoffensive looking becquerel per kg numbers of an invisible contamination now take a new dimension, as the violence of their power is suddenly revealed through their disingration sounds…..
TEPCO released a video showing a drilling rig, used in preparation for internal investigation of containment vessel No. 2 of Fukushima Daiichi Nuclear Power Station. The drilling was seated against the CRD hatch inside unit 2, the selected site where a robot will be inserted into unit 2 containment to collect data and images. Due to shielding blocks difficult to remove and high radiation levels found where the hatch gasket had melted away, this work has been repeatedly delayed. Logos from IRID, Toshiba and IHI are displayed on that drilling rig. IRID is the decommissioning research and development group. Toshiba handles the inspection and response work at the site and was a prime contractor at Daiichi before the disaster. IHI Corporation does a variety of high tech work including the energy and aerospace industries. Little is known about the capabilities of that drilling rig. To conduct the containment inspection the workers will have to insert a robot into the CRD hatch tube.Earlier in the process it was decided to drill out an opening on the hatch rathen than trying to open it. In similar works at unit 1 a large tube shaped rig is connected to the containment port to act as a hot cell, to enable the robot to enter and exit the containment structure without having radiation or radioactive materials to escape. Similar efforts at unit 1 involved connecting a large tube shaped rig to the containment port that acts as a hot cell. This allows the robot to enter and exit the containment structure without allowing radiation or radioactive materials to escape. Earlier practiced work at Unit 2 showed workers training with such a hot cell unit. Asahi Shimbun had reported on September 2016 that TEPCO has announced they would begin the robotic containment inspection of unit 2’s containment in early 2017. This new development might be a sign that they have overcome the difficulties that caused delays since 2014. My deep respect for this father courage and perseverance to search for his child beyond his pain and the tragedy. It must be awful to search for the remains of your beloved daughter like he did for 6 years. I have been repeatedly hearing about his relentless search over and over again during these past 6 years. I am happy for him that he finally found her. My own daughter was very lucky, at the time the tsunami hit the place where they lived on the north-east coast of Iwaki city, right by the sea, they were all in town, far from their house and the seashore. They lost their house but no life. Yuna Kimura was 7 years old when the 2011 Great East Japan Earthquake and tsunami struck. OKUMA, Fukushima Prefecture–A man’s painstaking search over nearly six years has finally uncovered remains of his 7-year-old daughter who disappeared in the 2011 tsunami. But the discovery has not brought closure for the father, Norio Kimura, who plans to keep sifting through the debris on the coast of this town in the shadow of the ruined Fukushima No. 1 nuclear power plant. A breakthrough in his private search for daughter Yuna came on Dec. 9, when a volunteer found a scarf she was wearing on the day the tsunami struck. It was near the coast only a few hundred meters from where Kimura’s home once stood in Okuma. A further search of the area uncovered parts of neck and jaw bones among the tsunami debris. A DNA test conducted by Fukushima prefectural police showed the remains were of Yuna. Kimura was informed of the test result on Dec. 22. However, he said he still has no intention of submitting a document to officially certify her death until the rest of her body is found. Yuna was the last resident of Okuma officially listed as missing. Kimura’s house was located about 4 kilometers south of the Fukushima No. 1 nuclear plant and 100 meters from the coast. The tsunami spawned by the Great East Japan Earthquake on March 11, 2011, destroyed the home and swept away Yuna, Kimura’s wife, Miyuki, then 37, and his father, Wataro, then 77. The bodies of Miyuki and Wataro were recovered that year. But Yuna remained missing. The meltdowns at the nuclear plant forced Kimura to evacuate from Okuma and halt his search for Yuna. Although the Self-Defense Forces, firefighters, police and volunteers conducted searches along the coast of the Tohoku region, radioactive fallout prevented extensive checks around Okuma in the early days of the recovery effort. Most parts of the town are still located in the government-designated “difficult-to-return zone” because of high radiation levels. Access is limited to former residents, but only for short periods. Kimura resumed his personal search for Yuna at the end of 2011, when the government allowed those limited-period returns to Okuma. After settling in Hakuba, Nagano Prefecture, with his mother and surviving daughter, Kimura frequently made round trips of about 1,000 kilometers in his search for Yuna. He often wore protective clothing against radiation in his endeavor. Yuna’s remains were found in an area where Kimura discovered a shoe in June 2012 that his daughter was wearing on the day of the disaster. Kimura said he intends to increase his trips to Okuma and focus his search on the area where Yuna’s bones were discovered. An agency affiliated with the Japanese government is to study the possibility of burying nuclear waste at a depth of about 5,000 meters. That’s much deeper than proposed in the government’s current plan. Researchers from the Japan Agency for Marine-Earth Science and Technology, or JAMSTEC, will carry out a basic survey for the new disposal option after next April. The survey will be conducted at Minamitorishima, a remote island above the geologically stable Pacific Plate. JAMSTEC says it will use a research vessel to collect data on the topography and geology of the area. No technology exists to bury nuclear waste 5,000 meters below ground as there are many technical challenges. The Japanese government has been planning to bury high-level radioactive waste from nuclear plants at a depth of more than 300 meters in final disposal facilities. Officials are currently looking for candidate sites. Nagasaki University Professor Tatsujiro Suzuki is a former member of Japan’s Atomic Energy Commission. He says it is too soon to discuss a technology that has yet to be developed, but he thinks basic research by the agency could help to create more options. Clashes over energy in Ukraine between the West and Russia could prompt another Chernobyl-type accident or a catastrophe on the order of a Fukushima that will complete the nuclear devastation of the Northern Hemisphere. As news media fixate on conflicts over pipelines that supply Europe with Russian gas, another energy war is erupting over control of Ukraine’s nuclear-power industry, which generates half that nation’s electricity. Prime Minister Arseniy Yatsenuk’s campaign for “energy independence” from Russian-sourced natural gas and nuclear fuel is not a study in cost control, economic security or even national sovereignty. His corporate-giveaway policies are actually a concession to Western energy interests in return for their influence over the EU, which can provide loans to avert an imminent default on Kiev’s debt to the IMF and World Bank. With an annual budget shortfall of $15 billion and a currency collapse, Ukraine is staggering under external sovereign debt estimated at between $140 and $200 billion. The IMF and World Bank have halted further transfers of loan tranches to Kiev, which is now unable to make payments on its gas imports from Russia. Kiev policymakers are therefore desperately looking to expand their nuclear industry. Unfortunately two recent accidents at its largest nuclear-power plant highlight the serious risks to a nation still grappling with the long-term effects of the 1986 Chernobyl meltdown. In stark contrast with eco-conscious capitals across Europe, Kiev is unable to resist foreign demands to adopt the Texan model of boom-and-bust energy extraction. Chevron and Shell have launched fracking projects to tap shale-oil deposits across Ukraine, but exploration and revenues have been delayed by the fierce fighting in the Donetsk region. Ukraine also possesses one of Europe’s few exploitable uranium reserves in its Kirovograd and Dnipropetrovsk regions, now being targeted by the French nuclear giant AREVA in cooperation with local partner VostGOK. An ongoing series of nuclear-fuel deals between Toshiba-Westinghouse and Ukraine energy monopoly Energoatom is aimed at severing Kiev’s reliance on Russian technology and Kazakh uranium. The competition to supply the global market for MOX (mixed oxides of uranium and plutonium) is pitting a consortium of Westinghouse, AREVA and their US suppliers against their Moscow-based rival Rusatom and nuclear-engineering firm TVE. Beset by losses of orders from Japan, the AREVA MOX fabrication plant in France is facing a new and strong challenge from the Rusatom pellet facility in Krasnoyarsk, western Siberia, which has replaced the aging Mayak fuel plant. To reduce stockpiles of plutonium-laced spent fuel rods stored inside power plants, the global nuclear industry is pushing to introduce advanced prototypes of fast-breeder reactors, which burn a variety of nuclear fuels including plutonium. Rusatom is producing MOX pellets for a next-generation fast-breeder to start operation this year at Beloyarskaya. The Russian design is the chief rival for next-generation breeder reactors being developed by the French ASTRID program in the Rhone region and the Hitachi-GE Horizon project along Britain’s Irish Sea coast. In this global race to revive the fortunes of the nuclear industry, Chernobyl and the ongoing Fukushima cataclysm spewing radioactive waste into the jet stream over Europe have all but been forgotten. The powerful explosion of MOX fuel rods at Reactor 3 in Fukushima nearly four years ago prompted Britain to close its Sellafield MOX fuel-rod production facility and convinced the Department of Energy to suspend construction on the US mixed-oxide project in Savannah River, South Carolina. These setbacks for the US-UK nuclear industry left the AREVA’s Mercoule facility in the southern French region of Languedoc-Roussillon as the only MOX producer in the West. Ulterior motives lurk behind the Ukraine sales pitch. The year-end push by Toshiba-Westinghouse o supply nuclear fuel to Kiev is a backhanded tactic to overturn the DOE decision to halt construction on the Savannah River MOX fuel fabrication facility. Anti-Moscow rhetoric and geopolitical arguments for switching Ukraine to Western-based energy systems (fracking, tanker-delivered oil imports and MOX fuel) bolster the odds for congressional funding to complete the Savannah River MOX facility. As Terrorist are able to acquire fissionable Enriched Uranium TEPCO and Russia cut a deal – Nothing to see here! Instead we got a huge increase in other nuclear stories because President Trump did a “nuclear tweet” (The timing was suspicious if I were a PR guy btw) . Talk about an over reaction to a non story by the media around the world. The reality of this Indian report was overlooked and the actual fact that Jihadists have been able to access over 4 million dollars worth (9KG) of the fissionable HEU, means that they are now able to make a small nuclear device cheaply with low tech means with the billions from oil revenues from the Syrian and Iraq conflicts under the noses of the USA and Russia, we might assume they have bought more than just a measly 4 million dollars worth perhaps? Instead of the IAEA and associated nuclear watchdogs stepping in to stop the sale and movement of HEU and similar products we see nuclear deals are just being struck for billions of dollars to ship this material around the world without finding out who and where this black market nuclear material is being sold. One such deal has been realised between Rosatom and TEPCO that are possibly two of the most nontransparent companies facing financial problems since the Fukushima 2011 nuclear disaster and the resulting economic collapse in nuclear investments. The fact that this important story is being ignored should worry us all as it means we are not on our guard for a planned attack. There are 2 main scenarios with terrorists being obviously able to get a hold of this with the huge financial resources at their disposal as they would likely have paid for more than just 9 Kg as the material was so cheap (as reported by the Indian police). It is likely they could have bought hundreds of kilos of the material at a discount rate with no problem. So is this the only HEU they have? 1/ They could make small detonating devices with a low kiloton yields. This would mean some planning but they would likely try to get the materials in place and then launch a multiple attack. They would likely find it difficult to make a second such attack, by then, preparations for monitoring for radioactive materials could be put in place and transporting materials would be hard. It would be better to begin looking for these materials now. 2/ they could grind up the metal and feed it into a food processing plant (such as baby milk powder etc) and this would likely result in hundreds of thousands of casualties but would not be discovered for possibly many years. Such an attack could be prolonged and cause great damage before it was discovered. So what can we do about it? If the authorities and Media ignore the story and hope it goes away then, nothing could be done. As this material can be easily transported and distributed to many cities (they used 2 motorcycles to transport it and were stopped on the road to or from Mumbai) and if this is a large coordinated strategy then other packets are on route as we speak. 1/ The cat is out of the bag and there is no return so we should start to monitor for the movement of these materials across borders and into large cities. 2/ The security services should concentrate their resources on these terrorist networks instead of civil society activists etc. 3/ The wars should stop and we should be trying to win hearts and minds instead of dropping bombs so as to get better intelligence than the cyber warriors can or have supplied (cyber warriors have obviously already failed to stop them getting this material and many reports including testimony from Edward Snowden have proven). 4/ All nuclear waste of both high and intermediate levels needs to be secured worldwide and the failed institutions such as the IAEA need massive reforming and better transparency. 5/ we need to stop making more of this material and need to close the existing nuclear power plants down and create a safer and more sustainable energy network. 6/ The major powers need to stop playing games with politics and start working together as they quietly do in the financial and nuclear sectors. JSC “TENEX” is one of the world’s major exporters of the NFC front end products, which supplies approximately one third of the uranium enrichment services required for western-type reactors. The Company – which has 100% of its share capital owned by Atomenergoprom – is part of State Corporation Rosatom’s Corporate Development and International Business Unit. TENEX operates to promote the interests of the Russian nuclear industry while making the best possible use of its export potential and competitive advantages in strict compliance with the applicable law and quality assurance, security and “”social responsibility”” standards. No wonder that the nuclear lobby is in a panic to spread its spin all over the world. Their lies, about curing climate change with Small Nuclear and Big Nuclear, remain lies, no matter how fervently the nuclear industry and its media acolytes repeat them. The nuclear panic is on, because genuinely clean energy, (and energy conservation), are developing so fast, ever cheaper and more efficient, that it’s becoming evident that New Nuclear doesn’t stand a chance. Renewable energy is inexorably becoming cheaper, even without subsidies. Wind energy is the cheapest form of new electricity generation available today. Solar power is on the way to beating even wind. Compared to nuclear, both forms are fast to set up, and provide many more and cleaner, jobs. This month, this website will bring a focus onto the fast-growing renewable energy movement. In 2017 the nuclear lobby lies should not prevail. In a world where a jury acquitted O J Simpson of a double murder, and a nation elected Donald Trump for President, it is more important than ever, for lies and dishonest spin top be exposed. 2016 brought a new word – the Anthropocene. It has been the year in which many of us realised that the planet has been irrevocably changed- by the human species. Of the wide-ranging effects of human activities,climate change is the one that has now become the most terrible threat. People around the world are trying to change our destructive ways: individuals, town councils, city mayors, states, and, to a much lesser degree, national governments work to conserve energy and promote renewable energy generation. Countering that, the polluting industries have used their think tank front groups, and mainstream media, to confuse the public, and deny the science. In November 196 countries participated in the United Nations Climate Change Conference in Marrakesh, to develop agendas for carrying out the the Paris Agreement of 2015. But international action was hampered by the presence of fossil fuel companies, and even more, by the election of climate sceptic Donald Trump to the USA presidency. Nuclear power issues focussed on both the decline of the nuclear power industry, and the desperate efforts of the industry to survive. Notably in Britain, a clearly uneconomic pro nuclear programme has been pushed, with the gigantic Hinkley white elephant in the lead. In America, subsidising of nuclear power is a contentious issue. Meanwhile. nuclear countries, unable to make the nuclear industry profitable, and unable to deal with its toxic wastes, have persisted in their marketing drive to export nuclear technology. The target countries are many, but South East Asia is a prime example. That campaign for SE Asia suffered a setback when South Australians rejected an ill-advised government push to commercially import nuclear wastes – a plan that was intended to solve the problem for new nuclear stations in South East Asia. Within the nuclear lobby, a quiet battle has gone on between the conventional Big Nuclear Reactor industry, and the campaigners for Small Nuclear Reactors. The latter reactors do not exist, but their hype is everywhere, particularly led by Bill Gates and various nuclear front groups. Unfortunately, Gates has bought into the nuclear lobby’s deception about nuclear fixing climate change. So – we end the year with climate change not just looming, but already here, endangering us and other species. The extraordinary attention given to Donald Trump and his impact on global climate and nuclear policy leaves us with very worrying questions. Depleted uranium, used in some types of ammunition and military armour, is the dense, low-cost leftover once uranium has been processed…. A high-ranking official from Veterans Affairs says a handful of vets mistakenly believe their bodies have been damaged by depleted uranium…..
the Federal Court of Canada has found depleted uranium to be an issue. The court ruled the Veterans Affairs Department must compensate retired serviceman Steve Dornan for a cancer his doctors say resulted from exposure to depleted uranium residue. Poisoned soldier plans hunger strike at minister’s office in exchange for care, Montreal CTV.ca Andy Blatchford, The Canadian Press, 30 Oct 11, MONTREAL — An ex-soldier who says he was poisoned while serving overseas is planning to go on a hunger strike outside the office of Canada’s veterans affairs minister until he gets medical treatment. December 22, 2016, by Radio Ecoshock Well I guess the triple-meltdown nuclear disaster at Fukushima is all over. It must be. We’re not hearing much about it, right? As we’re about to find out, the silence about the continuing horror in Japan is no accident. Bernie Sanders urges Congress to stop Donald Trump launching nuclear arms race Democrat speaks out after President-elect appears to reverse decade’s-old policy of disarmament, The Independent, Charlotte England @charlottengland Saturday 24 December 2016 Bernie Sanders has urged Congress to stop Donald Trump launching a Cold War-style nuclear arms race. Earlier on Friday, the US President-elect was asked to clarify the meaning behind an ambiguous tweet in an interview with MSNBC. “Let it be an arms race,” he is reported to have told co-host Mika Brzezinski,in a telephone call……..
Laicie Heeley, a nuclear expert at the Stimson Center, a nonpartisan anti-nuclear proliferation think-tank in Washington, told AFP news agency it was “reckless” for Mr Trump to tweet on the topic without offering details. “To make such a loaded statement without context or follow-up is irresponsible at best,” she said. Minutes after Mr Trump’s follow up remarks were reported on MSNBC, his secretary Sean Spicer said in several television interviews that there would be no arms race because the President-elect would make sure that other countries trying to step up their nuclear capabilities, such as Russia and China, would decide not to participate. Scientists in the U.S. have identified an ominous trend in the Southern Ocean—the creation of enormous icebergs as rifts develop in the shelf ice many miles inland. And although three vast icebergs have broken from the Pine Island glacier in West Antarctica and drifted north in this century alone, researchers have only just worked out what has been going on. Their first clue came from a telltale shadow in the south polar ice, caught by a NASA satellite and visible only while the sun was low in the sky, casting a long shadow. It was the first sign of a fracture 20 miles inland, in 2013. Two years later, the rift became complete and the 580 sq km iceberg drifted free of the shelf. “It’s generally accepted that it’s no longer a question of whether the West Antarctic Ice Sheet will melt—it’s a question of when,” said study leader Ian Howat, a glaciologist in the School of Earth Sciences at Ohio State University in the U.S. The scientists report in Geophysical Research Letters journal says that they discovered that although shelf ice could be expected to wear at the ocean edge, something else was happening in West Antarctica. The Pine Island glacier is grounded on continental bedrock below sea level, which means that warming ocean water could penetrate far inland beneath the shelf, without anyone being conscious of any change. The first evidence of something unusual was a valley—the one highlighted by shadows visible only at a particular time and captured by NASA imagery—in the ice, where it had thinned. The valley was the first outward sign that ice was melting far below the surface. The shelf ice plays an important role in slowing the progress of south polar glaciers: remove the shelf ice and the glacier flow accelerates. Researchers have already identified evidence of glacier retreat in the West Antarctic and warned that bodies of ice massive enough together to raise global sea levels by three meters could—thanks to global warming as a consequence of fossil fuel combustion—be increasingly unstable. The really troubling thing is that there are many of these valleys further up-glacier. If they are actually sites of weakness that are prone to rifting, we could potentially see more accelerated ice loss in Antarctica. Antarctica is home to more than half the world’s fresh water. The Pine Island glacier and its neighbor and twin, the Thwaite glacier, are at the outer edge of an ice stream. In effect, they have “corked” the flow. But West Antarctica is warming far more swiftly than the rest of the south polar region. 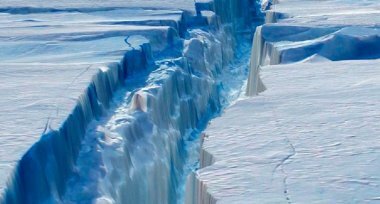 And the calving of huge icebergs fuels researchers’ fear that, within 100 years, the entire West Antarctic ice sheet could collapse, with disastrous consequences for many coastal cities worldwide. Since the first nuclear test on July 15, 1945, there have been over 2,051 other nuclear weapons tests around the world. No other force epitomizes the absolute destructive power humanity has unlocked in the way nuclear weapons have. And the weapons rapidly became more powerful in the decades after that first test. The device tested in 1945 had a 20 kiloton yield, meaning it had the explosive force of 20,000 tons of TNT. Within 20 years, the US and USSR tested nuclear weapons larger than 10 megatons, or 10 million tons of TNT. For scale, these weapons were at least 500 times as strong as the first atomic bomb. To put the size of history’s largest nuclear blasts to scale, we have used Alex Wellerstein’s Nukemap, a tool for visualizing the terrifying real-world impact of a nuclear explosion. On August 25 and September 19, 1962, less than a month apart, the USSR conducted nuclear tests #158 and #168. Both tests were held over the Novaya Zemlya region of Russia, an archipelago to the north of Russia near the Arctic Ocean. No film or photographs of the tests have been released, but both tests included the use of 10-megaton atomic bombs. These blasts would have incinerated everything within 1.77 square miles of their epicenters while causing third-degree burns up to an area of 1,090 square miles. On November 1, 1952, the US tested Ivy Mike over the Marshall Islands. Ivy Mike was the world’s first hydrogen bomb and had a yield of 10.4 megatons, making it 700 times as strong as the first atomic bomb. Ivy Mike’s detonation was so powerful that it vaporized the Elugelab Island where it was detonated, leaving in its place a 164-foot-deep crater. The explosion’s mushroom cloud traveled 30 miles into the atmosphere. Romeo was the second US nuclear detonation of the Castle Series of tests, which were conducted in 1954. All of the detonations took place over Bikini Atoll. Castle Romeo was the third-most powerful test of the series and had a yield of 11 megatons. Romeo was the first device to be tested on a barge over open water instead of on a reef, as the US was quickly running out of islands upon which it could test nuclear weapons. The blast would have incinerated everything within 1.91 square miles. On October 23, 1961, the Soviets conductednuclear test #123 over Novaya Zemlya. Test #123 used a 12.5 megaton nuclear bomb. A bomb of this size would incinerate everything within 2.11 square miles while causing third-degree burns in an area of 1,309 square miles. No footage or photographs of this nuclear test have been released. Castle Yankee, the second-strongest of the Castle series tests, was conducted on May 4, 1954. The bomb was 13.5 megatons. Four days later, its fallout reached Mexico City, about 7,100 miles away. Castle Bravo, detonated on February 28, 1954, was the first of the Castle series of tests and the largest US nuclear blast of all time. Bravo was anticipated as a 6-megaton explosion. Instead, the bomb produced a 15-megaton fission blast. Its mushroom cloud reached 114,000 feet into the air. The US military’s miscalculation of the test’s size resulted in the irradiation of approximately 665 inhabitants of the Marshall Islands and the radiation poisoning death of a Japanese fisherman who was 80 miles away from the detonation site. From August 5 to September 27, 1962, the USSR conducted a series of nuclear tests over Novaya Zemlya. Tests #173, #174, and #147 all stand out as being the fifth-, fourth-, and third-strongest nuclear blasts in history. All three produced blasts of about 20 megatons, or about 1,000 times as strong as the Trinity bomb. A bomb of this strength would incinerate everything within 3 square miles. No footage or photographs of these nuclear tests have been released. On December 24, 1962, the USSR conductedTest #219 over Novaya Zemlya. The bomb had a yield of 24.2 megatons. A bomb of this strength would incinerate everything within 3.58 square miles while causing third-degree burns in an area up to 2,250 square miles. There are no released photos or video of this explosion. On October 30, 1961, the USSR detonated the largest nuclear weapon ever tested and created the biggest man-made explosion in history. The blast, 3,000 times as strong as the bomb used on Hiroshima, broke windows 560 miles away, according to Slate. The flash of light from the blast was visibleup to 620 miles away. The Tsar Bomba, as the test was ultimately known, had a yield between 50 and 58 megatons, twice the size of the second-largest nuclear blast. A bomb of this size would create a fireball 6.4 square miles large and would be able to give humans third-degree burns within 4,080 square miles of the bomb’s epicenter. The first atomic blast was a fraction the size of the Tsar Bomba, but it was still an explosion of almost unimaginable size. According to the NukeMap, a weapon with a 20-kiloton yield produces a fireball with a radius of 260 meters, making its total width the size of 5 football fields. It would spew deadly radiation over an area 7 miles in width, and would produce third-degree burns in an area over 12 miles in width. If dropped over lower Manhattan, a bomb of that size would kill over 150,000 people and produce fallout stretching all the way to central Connecticut, according to the NukeMap. The first atomic bomb was tiny by nuclear weapons standards. But its destructiveness is sill nea lry impossible to grasp. ‘Unrecoverable’: revealed N-documents show Iran can not make nuclear weapons , The Age, Vienna, 24 Dec 16 : In an unusual move, Iran and six world powers have released previously restricted documents about their nuclear deal to enforce their view that Tehran is not in a position to try to make nuclear weapons. Some of the documents are dated January 6, 2016, shortly before the pact was implemented. But they were not made public until Friday, when they were posted on the public website of the International Atomic Energy Agency. The IAEA is monitoring the nuclear deal, which Iran reached with Germany and the five permanent UN Security Council members – the United States, Russia, China, France and Britain. The agreement stipulates that Iran can possess only low-enriched uranium, which is not suitable for weapons, and it is limited to possessing no more than 300 kilograms at any time. That is far less than would be needed to make a nuclear weapon even if it were further enriched to weapons-grade levels used for the core of nuclear warheads. When the nuclear deal was agreed on, Iran had more than 100 kilograms of liquid or solid waste containing low-enriched uranium as part of its enrichment activities. Some of the material remains and the documents posted on Friday declare the low-enriched uranium it contains as “unrecoverable” and thereby not part of the 300-kilogram limit. A letter on behalf of the European Union’s foreign policy chief, Federica Mogherini, authorising publication of the documents was also posted on the IAEA website. Alex Smith, Radio Ecoshock, 22 Dec 16 The fossil fuel industry, and their paid climate deniers, have taken control of the government of the United States. Russia, another major world supplier of oil and gas, played it’s part, raiding the servers of the Democratic Party, the Democratic Candidate, and their campaign Chair.